Nutopia : BREAKING NEWS: Will Smith to host One Strange Rock! 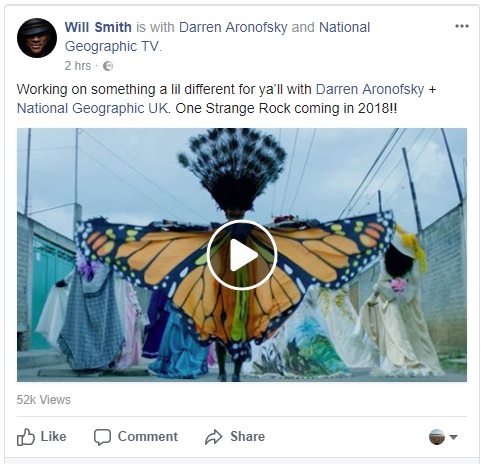 BREAKING NEWS: Will Smith to host One Strange Rock! Smith took to Facebook to make the announcement with a teaser video here - https://www.facebook.com/92304305160/videos/10155684645261005/. In the 10-part global event series, Smith will guide viewers on an epic journey across the globe and into outer space. One Strange Rock promises to be a mind-bending trip within and beyond planet Earth, affirming that there really is no place like home. The Nutopia and Protozoa Pictures series is slated to premiere globally on National Geographic in March in 172 countries and 43 languages.